In one week, Nora will be two. I know I always say, “I can’t believe…,” well I really can’t. Although, she does seem to be very much a two year old already with a strong independent streak, a chatterbox mouth, and the most adorable little girlishness about her. She certainly is completely different than she was at her birthday party last year. How things change. I say that a lot, too, don’t I? With Nora’s birthday only a week away, we’re in the last minute planning stages on everything I want to get done before then and/or before her party on the 11th…really, that should read “I’m in the last minute…” — Chris is the sane one around here and I’m the silly one who obsesses over color scheme and activities and cake types (and other things Nora could care less about). Which made me realize that last year I spent pretty much the whole month of August talking about Nora’s first birthday, and I haven’t once yet mentioned mentioned this year’s festivities. Initially, I thought that we might just do something low key with just our family. But since we don’t have family on island, that would have made it a day just for the three of us and I thought Nora might like a little more than that to make the day seem special. And, to be brutally honest, I L-O-V-E planning parties (in case last year didn’t tell you that). There are some really amazing parties out there and I drool just reading about them. (If you’re paying attention, you know by now this is really all about me.) With those things in mind, we decided to do something small, and because we were planning to build the play kitchen I thought a tea party would be perfect. Keeping in mind our budget and the fact that her play dishes have a place setting for four, we just decided to invite three other little two-year-olds and their mamas. There will be tea sandwiches, cookies, a mini tea set-topped cake, and of course tea. We’ll decorate hats and wear white gloves and pearls. 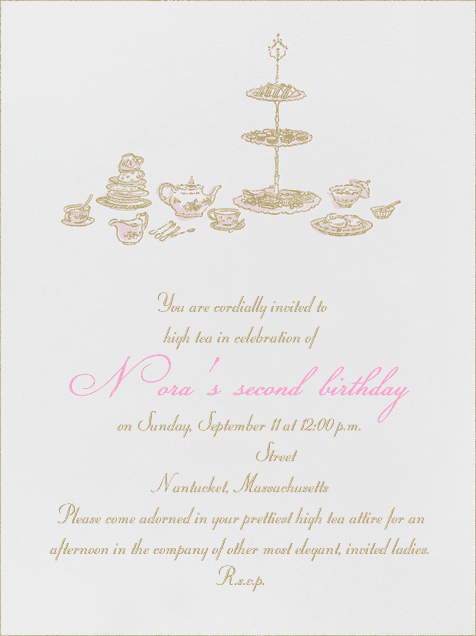 I know Nora is going to love it. In this last week, I have a rather adventurous to-do list: sewing cloth napkins and towels for Nora’s kitchen, sewing a bed skirt and clothes hamper cover for Nora’s new room, altering a dress for myself, painting Nora’s room, and sewing an outfit for Nora to wear on her birthday day. I’m looking forward to putting my creative juices to work, but also have to make sure I manage my time well. I have to sleep too!